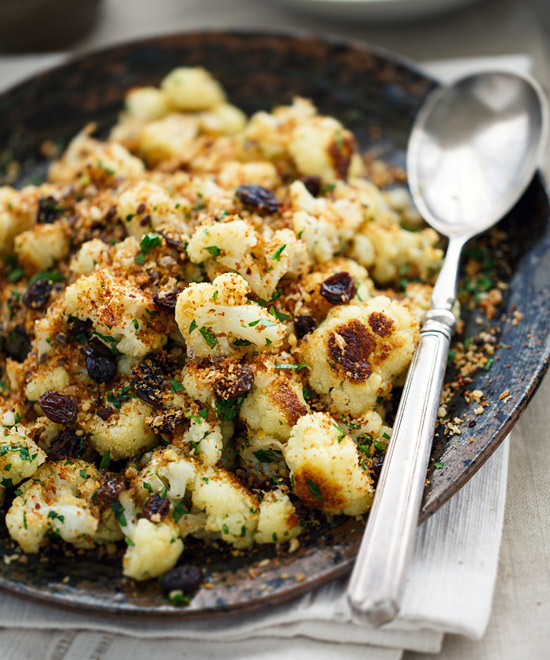 We love serving roasted cauliflower in a variety of ways: as a Sicilian side dish tossed with raisins, parsley and an anchovy-chili crumb; in our version of an Indian dry curry called Aloo gobi that combines roasted cauliflower and potato with onions, garlic, ginger and fragrant spices; and in a simple Mediterranean-style roast cauliflower soup with garlic, rosemary and Parmesan. 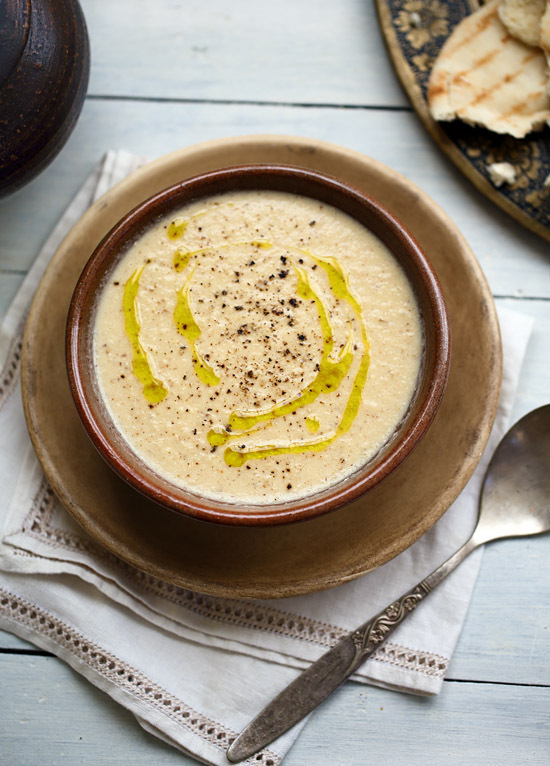 But without doubt, one of our favorite roasted cauliflower recipes is this Middle Eastern Roasted Cauliflower Soup with Tahini and Lemon. We’re addicted to the earthy and nutty flavor that the cauliflower takes on when it’s roasted, and the addition of the tahini and lemon makes it so creamy and comforting. 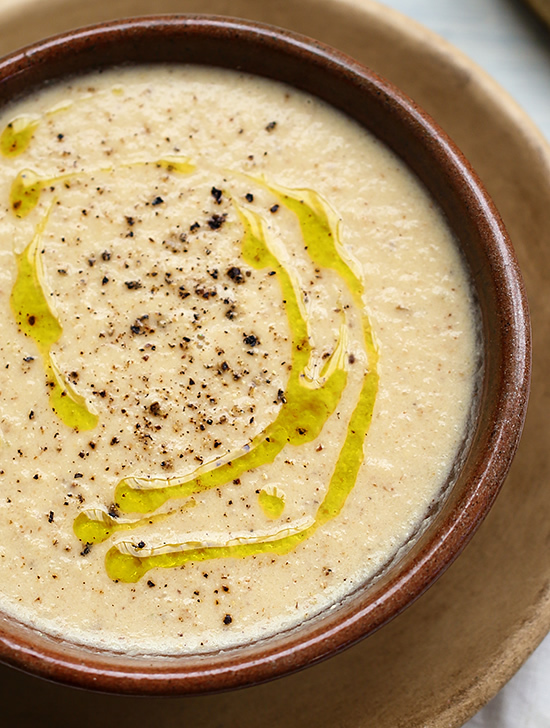 Tahini is made from sesame seeds that are toasted and ground into a thick paste. It not only imparts a unique flavor, but also a generous dose of healthy fats, calcium and protein. When the soup is served with a drizzle of extra virgin olive oil and a little freshly ground black pepper, it’s a revelation! This warming and comforting soup is a wonderful way to transform ordinary cauliflower into something extraordinary. The earthy taste of the roasted cauliflower is beautifully complemented by the nutty and creamy tahini (Middle Eastern sesame seed paste) and the slight tang of lemon. PREHEAT the oven to 450°F/230°C. TOSS the cauliflower florets in 2 tablespoons of oil. ARRANGE in a single layer on a large baking tray and cook for 15 minutes, then toss, and cook a further 10 minutes. WHILE the cauliflower cooks, mix together the tahini, water, lemon juice and salt in a small bowl until thoroughly combined. HEAT the remaining tablespoon of oil in a saucepan over medium heat. COOK the onion for 6 minutes, then add the garlic and cumin and cook for 2 minutes. ADD the stock, tahini mixture, and roasted cauliflower. 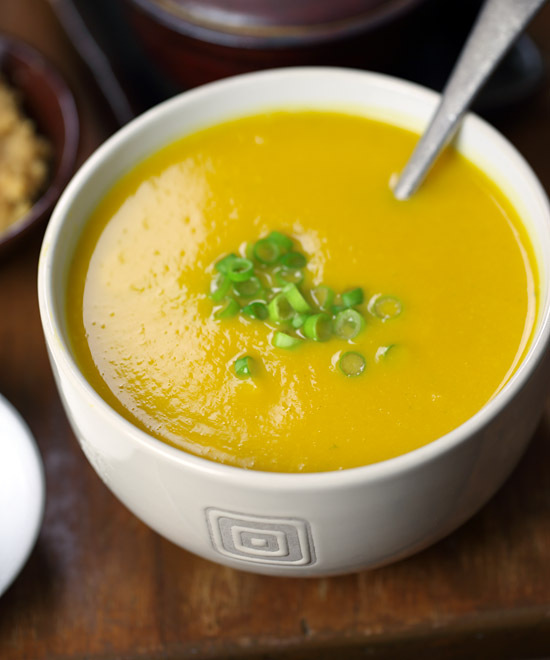 TRANSFER the soup to a blender and process until smooth. RETURN the soup to the saucepan to reheat. 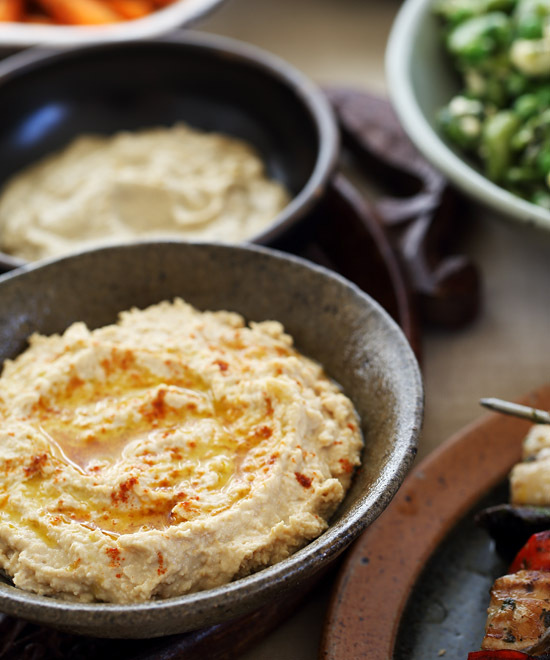 SERVE in bowls topped with a little drizzle of extra virgin olive oil and freshly ground black pepper.